Depending on which state of Australia you’re in, the school holidays are either looming on the horizon, or in full swing right now. Winter holidays can be a mixed bag of beautiful clear days, or weeks spent hibernating under blankets near the heater while the rain pours outside. Having a few inside activities up your sleeve to keep the kids from getting bored just makes good sense, and lucky for you, we’ve got some great photo craft ideas to keep you all occupied for the winter break. If you’re a fan of putting photos on your fridge (and who isn’t? 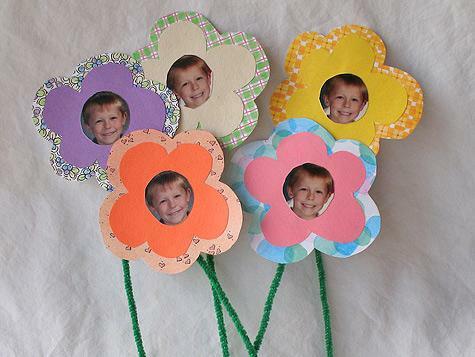 ), this quick and easy craft idea is a great one that the kids can help you with. Simply cut out your desired photos to the size of a bottle top, glue them in and attach magnet strips to the back. (Tip- you can use old magnets for your strips. The old calendar ones that real estate companies send out are great for this.) It won’t take long, and even younger school age kids can get involved. With more and more kids needing devices for school these days, this is a great way to set your child’s apart from the rest, and have some school holiday fun. You will need to purchase a transfer ready case, and some transfer paper, but apart from that, all you need are some great pics and an iron. More instructions at lil blue boo. Kids love being able to make things that they can look back on, and mini scrapbooks are great for that kind of thing. Even if you haven’t had an actual ‘holiday’ you can use these photo books to remember a fun day, or even to tell a made up story. Consider working together to tell the story of a favourite toy with photos, print them on your Pringo mini wi-fi printer, and then back them on some nice paper, and you’re all set. An illustrated masterpiece that you will enjoy looking back on. More instructions over at A Beautiful Mess. Older kids love taking photos, and their devices can be overflowing with selfies and random, but important-to-them, moments. Kids of this age (girls in particular), also often enjoying decorating their room in their own style, so why not combine the two loves and create one masterpiece? It’s as easy as buying a blank canvas, painting and decorating it as you like, and attaching photos with glue or washi tape. The end result is something they can look back on for years to come. This one from Crafts Unleashed is perfect and simple. OK so this one has nothing to do with photos, but it is a great school holiday activity to try. Toothpick painting using craft glue and funky neon paints on wooden shapes is a easy way to create some effective art. The kids will love it, and even little people can do it with ease. So there you have it; 6 activities to make your school holidays a fun, yet productive event, and give you all the more reason to give your Pringo mini wi-fi printer a work out. (As if you needed one ). What’s your favourite? Or do you have your own photo craft ideas? We’d love to hear them. Take a moment and think about your best friend. Who is she? What does she mean to you? What would you do without her? Or maybe your best friend is a he, and he’s always been the rock you’ve leaned on when times are tough, or the one you’ve danced with, when everything is fine and dandy. Having a best friend is one of the great gifts of life; you can do without a great many things, but you can’t do without a person, and that person should be celebrated. Quite often we think to make time for photos with our families or our significant other, but we don’t think to do the same for our bestie. A picture tells a thousand words, and the story of a best friend is easily worth ten of those. Why not tell that story loud and proud with some best friend photos that reflect who you both are, and also where you’ve been and what you’ve shared? All good friendships start somewhere, and what better way to remember that, than by recreating the memories of where it all began? Did it start on a hot summer’s day, where the water was the only place to sit and chat and tell all your secrets? Or on a shopping trip that you will both always remember. Was the beginning the same as so many others? Just hanging out laughing, and showing each other who you are; discovering that you were kind of the same. Maybe she has always been there, for as long as you can remember, and it’s time to recreate your childhood. However it began, recreating the beginning is a great way to remember why you became friends in the first place. Best friends are best friends for a hundred different reasons. Stop and take a moment to think how your best friend makes you feel. What can you do with her, that you couldn’t without her? Life changes, and friendship does too, hopefully growing stronger. It’s fun to look at where you’ve come from, and it’s just as fun to celebrate where you are now. Best friends awaiting expectant arrivals. Enjoying the novelty of a rare night out (perhaps get the photo at the beginning not the end of the night 😉 ). Having fun with the things that aren’t fun at all. Wherever it started, whatever she means, wherever you are now, a best friend is a special gift worth celebrating. Why not capture that BFF love with photos. And don’t forget to print your photos with your Pringo smartphone photo printer so you can share your photos instantly with your BFF. What’s the best photo you have taken with your BFF? There’s also the immediacy of being able to share moments. I would have loved to have had this when we left Darwin, so I could have given Taylah’s friends some pics of their last moments together. Similarly, I was thinking it would be a great thing to have for kids birthdays. You could set up a mini photo booth and let them have a great time snapping away, and then print the best pics. It would make a great take home present. I think I may have to do that for parties this year…. Who else has hundreds of photos stored on their smartphone? Surely it’s not just me! I take all these photos, but never get around to doing anything with them. If you’re the same then you’re going to love, love, LOVE what I just found! And it’s great for so much more than just happy snaps and selfies! It’s a Pringo Portable Photo Printer and it is awesome! My kids and I had a ball creating the photos and then watching it print. The poses that they did just so we could print them out were quite funny. Then getting them to add the boarders, stickers and other extras brought about squeals of delight. A fabulous little portable device that just pops into your handbag and allows you to print any photo from your mobile phone or tablet. Really this is so awesome you can even design your pictures to have patterns or a border , stickers. Your photo’s you chose how you want them to look fancy or plain. Overall I would highly recommend purchasing the Pringo Portable Photo Printer. We have had the product for three weeks and we have used the printer numerous times for a range of reasons. I would suggest that the Pringo Portable Photo Printer is suitable for use for families and also in the playgroup/daycare/school setting as it enables photos to be taken and printed immediately or later for use. I’m not a computer whizz and even I could use this! My son and I had a great afternoon printing off pictures for a family collage for Nanna. We added filters and colour stamps to individualise the prints. And my son loved it as a craft activity. It really was that easy. Mother’s day is just around the corner, and it’s this time of year that we stop to really think about mums – who they are to us, what they mean…and how on earth to put all those thoughts into the perfect present. Now every mum is going to differ in what they would prefer you do/not do, buy/not buy, make/not make, on this most special of all mothering days. However you don’t have to look too far past the mother proudly wearing a macaroni necklace in the shopping centre, to know that home made gifts are always well-received. We’ve put together 10 fun and fabulous ideas for home made crafts and other DIY gifts for Mother’s Day sure to help make this year the best Mothers Day yet. How cute are these flowers? Mum will not only love the thought, but the fact that the vase is included with the bouquet. Not to mention most homes will have almost all the materials on hand, making this a quick and effective gift idea. When a bunch of Mums received one of these each for Mother’s Day last year they all chuckled because they were all over-sized and really long. However almost a year later there are still plenty mums walking around the school-yard with their Scoubidou knotted key chains, (happy that they can still find their keys in their handbags) and a whole bunch of eight year olds proud as punch that their gifts are still in use. Mums are usually suckers for Photo gifts made from the heart. The best bit about these flowers, (apart from the super cute faces in the middle), is the fact that will be around for a lot longer than Mothers Day, and longevity in a gift is always welcome. The photos can be printed on your Pringo photo printer and cut to size. Add them to a decorated pot, (these ones were done with a funky array of washi tape), and you’re sure to have a gift to please. For the mum who likes practical things she can use, rather than just look at, why not try these hand dotted tumblers? Easy for little kids, cost effective and they look good to boot. You could even try the same idea on wine glasses or coffee mugs, depending on what the mum in your life prefers to drink. Mothers Are Angels on Earth Footprint. This is a super cute way to immortalise tiny baby feet as well as send a beautiful message. It would be a wonderful way to mark a first Mothers Day. Photo montages are great not just for mums, but for grandmothers too; particularly those that don’t like nearby. They can be as simple to organise as choosing your favourite photos, a family photo, or having fun taking some new ones. The kids would love being involved in a project like this, and you can tailor the drawings and message to fit your family. Of course then what better way to present the photos than with personalised photo frames? These repurposed frames would be a perfect way to display your Pringo printed photos, and the best thing is you can keep changing the display depending on your mood and what photos you’ve recently printed. Instructions at: What no mints. This is a lovely idea, especially heading into the cooler months when rooms and cars can easily get stuffy. Older children should be able to do this with not to much trouble, and it’s sure to make any mum smile. Painted rock garden markers are a great gift idea for the mum who loves spending time in her garden. Fun and practical, they are bound to a be a winner. So there you have it- 10 easy DIY gifts for Mother’s Day that won’t break the budget and will bring a smile to the face of that special mum in your life. 7 ways taking photos has changed and why it’s better now. Do you remember, back when you were a kid, and someone took your photo? It was a lesson in patience; both the process of the photo taking and the wait to get it developed. These days, we see something worth photographing, and we just take a pic, in fact we take a dozen, we select our favourite, make it pretty and then share the photo with everyone we know. You had to do it properly. Now I’m not familiar with the process of sitting for an oil painting, (not having lived in that era thankfully), but getting your picture taken when I was a kid, was, I assume, quite similar. It involved sitting still, posing perfectly, and not squinting at the wrong moment. You had to do it right, for no other fact than there were only 24 opportunities for photos on that roll of film (36 if you were super lucky), and the thought of ruining one was considered truly wasteful. There was no possibility for silly photos with fake smiles or an over abundance of teeth; taking photos was serious business. These days, our camera rolls are filled with pics of kids hanging upside down, or smiling in their own, very unique way, and it’s perfect. It’s natural, there’s no staging, and because we don’t have to limit the number of images, everyone can just be themselves and we can delete the ones we don’t like. 2. If you took a bad photo, you were stuck with it. The light might have been in your eyes, or someone made you laugh, or maybe your dad just hit the button before you were ready, but the camera did not care. You could pretty much guarantee, that on photo printing day, there would be at least one (if not a good third of the pics) with someone either talking, chewing, revealing something they shouldn’t be revealing, or their eyes half closed. And that bad photo was kept forever- hung proudly on the hallway wall, or put in some photo album that was pulled out at every family reunion, because photos were expensive, and you would never just throw one out. Once that photo was printed, it was the end, and you were doomed for all of eternity. These days, we take a thousand and one pictures until we find one that is perfect. Which is probably a good thing, otherwise Facebook would be a much scarier place. 3. Printing was an event. Now it might have been different in your home, but in ours, printing was an event. We didn’t just finish a roll of film and take it in to be developed; no we waited. Months sometimes, until there were enough rolls filled up to justify the whole thing. It wasn’t just the expense (although that did factor into it), but also the waiting. You took your rolls in one day, and then picked them up the next. As I got older, that changed, and the waiting was quicker, but it was still waiting. Sure you could walk around and do your shopping in that hour, but it dragged when you were getting photos developed because you couldn’t leave until they were done. Add to that the whole excitement of wondering what would be on them (because it was so long ago you had forgotten), and then the dismay that someone had put their finger over the lens, and it was a whole roller coaster of expectation and emotion. Printing is still an event, but thanks to Pringo mini wifi photo printers, you don’t have to wait at all, and everything is there at literally the touch of a button. 4. The pressure of removing the roll. Ok so between the necessity of sitting still, the terror of being branded with a terrible shot, and the frustration of the wait, the actual process of getting photos printed was full of pressure. I have very vivid memories of being told quite sternly to ‘never open the back of the camera,’as if the very universe might implode if I did. That pressure is now gone. No more film rolls means no more responsibility for being the one person who ruined all the memories. 5. Filters were for the professionals. One year I did a photography course on a school holiday program, and we got to learn the actual process of photo development in the dark room. It was all trays of chemicals and special paper, and hanging up photos after watching the images come to life. I remember two things vividly from that experience. One, you could alter the look of the picture depending on how long and what chemicals you shook it in. And two, if you made a mistake you could somehow flip the images in your photo. It was exactly like Pic Monkey but different. Of course getting things printed at the photo shop was a different matter, and you didn’t get a huge amount of choice in how you wanted your film developed, but you could express your artistic flair afterwards. Similar to what’s available on photo Apps today, you could add thoughts and words all with the help of a very convenient, stick-on speech bubble. As charming as those stickers were, today’s photo editing is coming up trumps. We can take the worst pic and turn it into something worth putting on a wall size canvas, with an inspirational quote printed on it to boot. Just a little more impressive than speech bubbles. 6. Sharing photos was done in person. With tea. Sharing of photos used to be like this all the time. After a wedding you would catch up and pour over the album with a cup of tea, being careful to ‘not touch the edges’in fear you would ruin the memories. (There’s that pressure again.) Every now and then someone will come over and the kids pull out their baby albums, sit on their laps, and then subject our visitors to a long and detailed explanation of our family history, full of interesting facts like a child’s favourite blanket, or ‘the time I bumped my head.’ Which is wonderful if you’re a close friend, but a little awkward if you’ve just come to drop over the mail you received by accident. Mostly these days, sharing is done online with a link or an app, or on social media. Now instead of having someone sitting on you while you try not to spill your tea, you can look at pics in real time (or as soon as they are uploaded), when it’s convenient for you. 7. You had to pack a camera. It was one of the special items in all kinds of bags; the camera. You might forget any other thing when going on holiday, or having a baby, but the camera could not be forgotten. Of course you also had to make sure you had plenty of film for it, and that your batteries were charged, or else it was all for naught. While you can still pack the ‘good’camera for those really important moments, smart phones do such a good job that half the time you don’t have to worry about it. You can get the pictures you need, plus the ones you want, and a couple of random selfies thrown into boot. And if that’s not a positive thing, I don’t know what is. So there you have it. Seven ways the world of image capturing has changed – and improved -since we were all little.